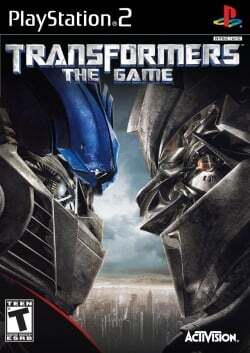 Game description: Based on the 2007 live-action feature film, Transformers: The Game lets gamers control the outcome in the battle for Earth as they choose to protect it as Autobots or destroy it as Decepticons. The game is mainly a third-person action-shooter. All the robots have at least five attack types: a light weapon, a heavy weapon, a melee attack, and the ability to throw objects such as cars, lamp posts, trees, etc., and using a long object like a lamp post as a sword. As its title and characters imply, a robot can transform into a vehicle and vice versa, this gives the game some racing elements, as the player must, in some missions, race to certain point within a time limit or before a character of the opposing faction does. Each area is an open world environment, and there are also side-missions, Energon cubes and Autobot/Decepticon emblems scattered through the city, if accomplished successfully/collected the player can unlock trailers, production photos and unlock color schemes for certain characters. Game works fine at a decent speed., GSdx HW mode got some transparency issues along with some texture bugs. Looks fine in Software mode. Not to be confused with The Transformers: Call of the Future (known as just Transformers) and Transformers. This page was last edited on 28 December 2016, at 18:47.